Two must-do events for cyclists in the Philadelphia and Montgomery County, especially those who live near Lower Merion Township and Manayunk, are around the corner. Mark your calendars! 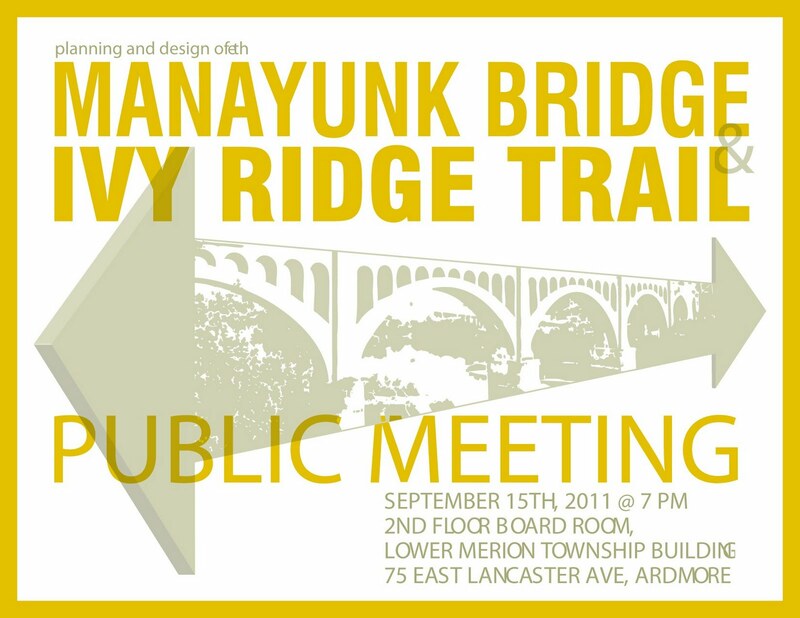 On Thursday, September 15th, trail design concepts for the Manayunk Bridge will be presented at a public meeting to be held at the Lower Merion Township offices at 7pm. 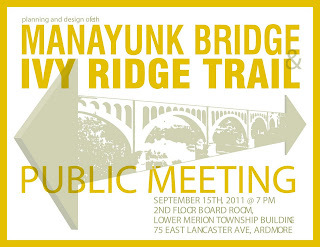 This is the YOUR BEST opportunity have input into the design of the trail across the Schuylkill River on top of the Manayunk Bridge. Lots of activities must be accommodated on the Bridge, and how bikes move through is an important component. Please attend if you plan to use the Bridge for transportation or recreation. The Manayunk Bridge will connect the Cynwyd Heritage Trail over to Schuylkill River Trail in Manayunk at Dupont and High Streets. Speaking of which, on Sunday, October 23 11am-2pm, Lower Merion Township will hold a Ribbon-Cutting Ceremony of the Cynwyd Heritage Trail at the Barmouth Station. This ex citing new 1.2 mile trail, designed by the Studios of Bryan Haynes, is an exciting new addition to the Regional Trail Network and is part of the a critical link between Lower Merion and Philadelphia. The opening will feature music, restaurant samplings and other festivities. Please RSVP to etrainer@lowermerion.org if you plan to attend. Bicycle Coalition staff will lead a ride from Center City to the ceremony. More to come closer to that date. I can't wait to see it, and ride over with the Bicycle Coalition! !